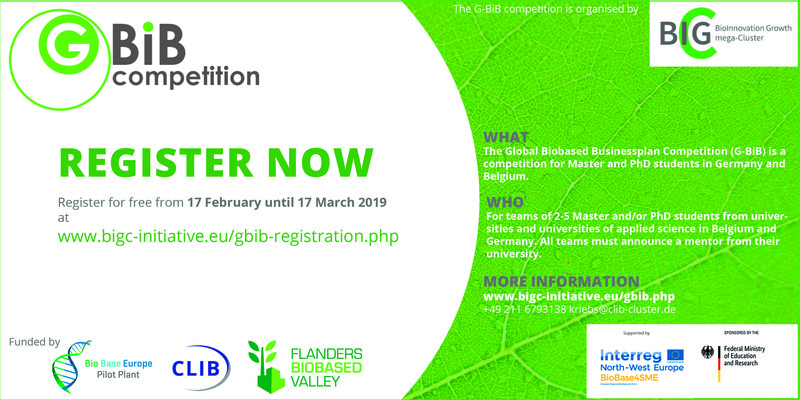 The Global Biobased Businessplan Competition (G-BiB) is a competition for Master and PhD students in Germany and Belgium. The objective of G-BiB is to stimulate entrepreneurship and innovation producing a bio-renewable chemical, material and/or fuel product. G-BiB is an initiative of the BioInnovation Growth mega-Cluster (BIG-Cluster). Find allrelevant information on the organisers website including the regulations.